Unlike AirPods which are 'the same', colourless and 'always fall out,' perhaps? • Update: Huawei Freelace have now officially launched, alongside Huawei FreeBuds Lite true wireless buds. Alongside the Huawei P30 and Huawei P30 Pro there will be Huawei's usual assortment of accessories and add-ons – possibly a new Huawei smartwatch, for instance – and it's been confirmed these will include some new headphones – probably wireless ones, because new, wired earbuds are something of a rarity these days. These don't seem to be Apple AirPods 2-style true wireless buds, they look like yer classic Bluetooth in-ears, with a narrow wire between the buds that you run behind your neck. You know the sort of thing. How do we know this? Because Huawei helpfully tweeted it. The buds are called Freelace – which autocorrect will render totally impossible to text as anything other than 'Freelance' – and will evidently come in a range of colours to match those of the Huawei P30 and P30 Pro, or to match your trousers. 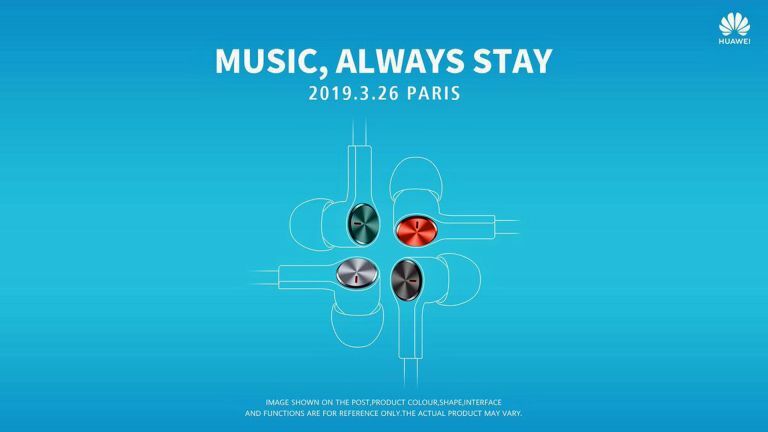 'Music, always stay' presumably means they have magnets in the buds, so they can be clipped together, and the headphones then worn around your neck like a kind of audiophile necklace. So they 'always stay' in position there or, obviously, in your ears. Or it could just be a mistranslation from Chinese. Who knows?